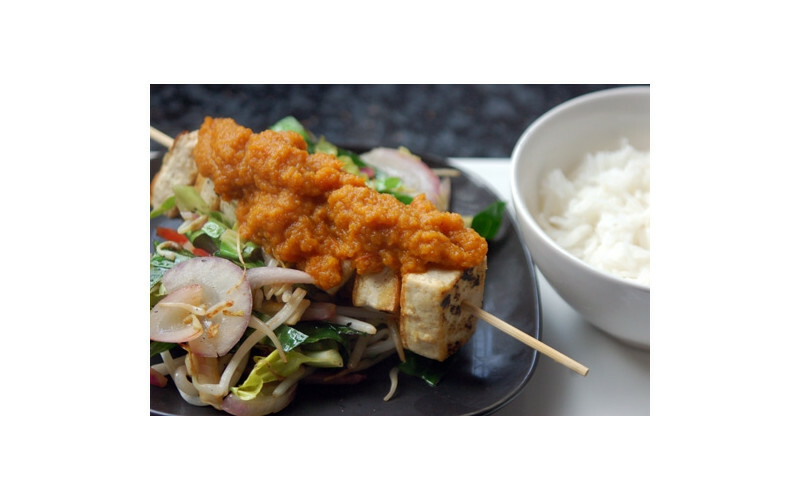 Drizzle this lovely sweet and sour sauce over tofu cubes and veg. It has a fresh, natural taste - not at all like the commercial syrupy version! Most types of firm tofu will work with it. If cooking brown rice from scratch, start it off now. If using white rice or rice noodles, time them so they'll be ready to serve when everything else is, (about 11-12 minutes for white rice, noodles according to packet instructions.) If using pre-cooked noodles or rice, follow the packet instructions about re-heating. To make the sauce, heat up all the ingredients together in a saucepan, but do not boil. Let it simmer gently while you prepare the tofu. If using ready-fried tofu pieces, omit stage 3. Drain the tofu, then cut it into cubes. Fry it in a frying pan or wok in a little hot vegetable oil or oil spray. Brown it off on each side. Turn regularly with a spatula. When the tofu is nearly ready, add in the packet of stir-fry veg, and cook them off for a couple of minutes. Add a bit more oil if required - or a splash of water/stock if you want the low-fat version. Meanwhile, take the sauce ingredients off the heat and blitz with a stick blender or similar. Drain noodles/rice if necessary. Serve rice/noodles into bowls, place vegetables on top then finish with the skewered tofu pieces. Spoon the hot sweet and sour sauce over the skewers. Drizzle with a little soya sauce if desired then serve hot.